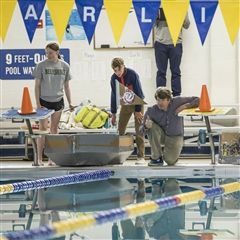 April 5 – Kate Daly’s eighth grade science students discovered that with two sheets of 4x8-foot cardboard, two rolls of duct tape, two wooden dowels, and two empty 2-liter soda bottles, they could design and build a boat seaworthy enough to carry one team member across a 75-foot-long pool. 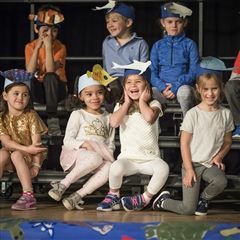 April 4 – The Sky Room was an "Ocean in Motion" on Thursday when Tina Boudreau's SPK students brought their under-the-sea songs and poetry to the stage! 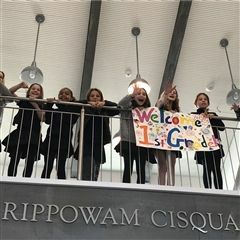 March 14 – The students of Rippowam Cisqua School’s Lower Campus hit new heights at this year’s annual STEAM Fair! 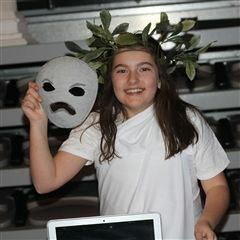 March 7 – Toga-clad sixth graders marked the end of their study of ancient Greece with an evening in the Agora (our Playhouse, transformed!) with family and friends. 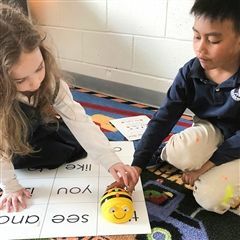 March 8– Kindergartners are learning to program with colorful Bee-Bots, little robots designed to teach young students counting, sequencing, estimation, and problem-solving. And they’re fun! 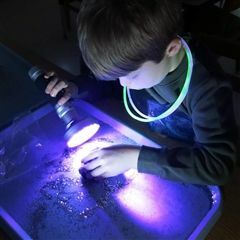 February 22 – Kindergartners were “over the moon” to return to school at night for the culmination of the Night Unit: our Night Party. 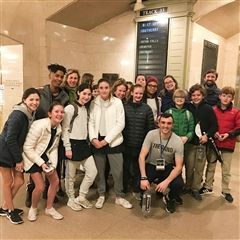 February 28 – The varsity squash season ended on Thursday with the finals of the RCS Cup, an intra-squad tournament organized by Coach Sednaoui. 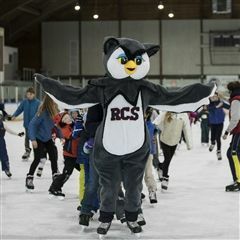 February 22 – There was one thing apparent at the Imagine Skating Party on Friday – our RippKids sure know how to brighten a room and have some fun while they’re at it! What a joy it was to see and be a part of such a fun community event. 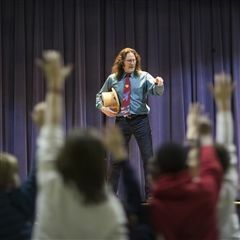 February 8 – As part of our Visiting Artists Series, Lower Campus students, faculty, staff, and attending parents were enchanted with award-winning master storyteller Jonathan Kruk. February 8 – It’s an annual favorite on the Lower Campus! 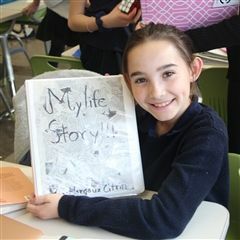 February 14 – Fifth graders were inspired to try and craft their own memoirs after RCS hosted New York Times bestselling author Kelly Corrigan on the Upper Campus last fall. 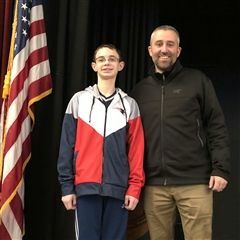 January 16 – Congratulations to eighth grader Sam Federman, the RCS Geography Bee champion – for the second year in a row. 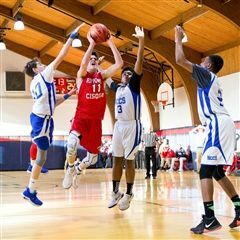 January 16 – Ripp’s Upper Campus gymnasiums come alive each winter with basketball. 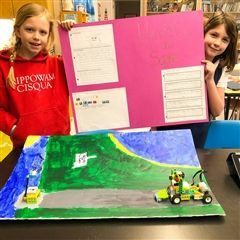 January 17 – RCS seventh graders and Kindergarteners have teamed up to design and build a miniature golf course together. 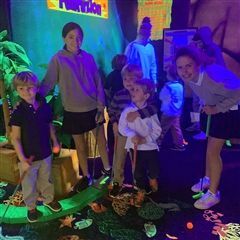 And not just any mini golf course – this one will glow in the dark. 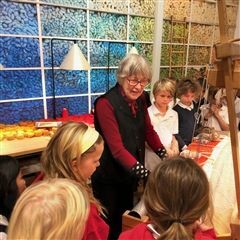 January 9 – The highlight for third graders visiting the Aldrich Contemporary Art Museum in Ridgefield, Connecticut, was meeting (and seeing at work) tapestry artist Helena Hernmarck. 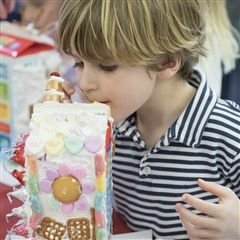 December 20 – What a wonderful way to celebrate the holiday season! 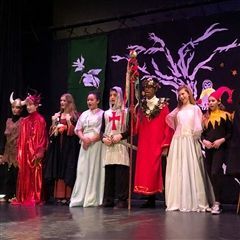 RCS families and friends enjoyed a day of music, skits, and dances with first the Grades 1-4 Holiday Concert on the Lower Campus, and then the Grades 5-9 Winter Solstice celebration, Revelry, on the Upper Campus.